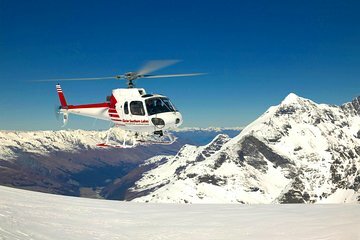 See New Zealand's spectacular alpine landscape on a 30-minute scenic helicopter flight from Queenstown. Fly over Skippers Canyon and the Wakatipu Basin, and land on a snow-capped peak. After pickup from your hotel in Queenstown, head to the airport to meet your helicopter pilot. Receive a safety briefing then board the modern 6-seater Airbus Squirrel helicopter. Lift up into the air and soak in spectacular views of Skippers Canyon, the Wakatipu Basin, and Queenstown. The route depends on the day's snow conditions. Your helicopter tour includes land in the snow on one of the region's peaks, with snow landings happening year-round. After 30 minutes, return to the base in Queenstown where you are transferred back to your hotel. Due to comfort and weight / balance of the aircraft, passengers must supply accurate weights upon booking. Perfect weather. Staff were friendly. Pilot was amazing! Narrating fun facts on places we hover. Was totally entertaining my kids. Flew through a cloud. Hovered over waterfalls. And made us play on the snow for as long as we can. Also took amazing photo with the helicopter whilst at the glacier. Super amazing experience!!! The tour was amazing. My partner and i had a great time .just to.short. guide chris was great with lots of knowledge. Top rating amd highly recommend.must for all. Great ride! Amazing majestic views! Pilot was great! Can't believe we landed on top of one the mountains! Outstanding! !